Would you like to connect with your pet and find out what they are thinking? Animal lovers can find out how to connect and consider their wellbeing more indepth. Are they a rescue and have a dark past? Do you wonder if the past is still effecting them now? Whatever your animal companion be them a Cat, Dog, Horse, Fish, Lizard or any other pet, a Tarot card reading can really help open up your mind to what your pet is thinking. Send me your Question now to reveal all. Simply choose how in-depth you wish the Tarot to go by selecting One, Three or The Full Celtic Cross of Thirteen Cards. 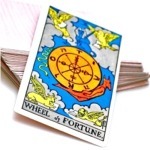 1 Card Psychic Tarot Card Reading – (1 Question) Focuses briefly on the Present time. No follow up questions permitted. 3 Card Psychic Tarot Card Reading – (Up to Three Questions) Focuses briefly on the Past, Present and Future. No follow up questions permitted. Full Celtic Cross - 11 Cards focusing in-depth on the Past, Present and Future. You can ask Tilly any questions after the Tarot reading. Great for specific insights.